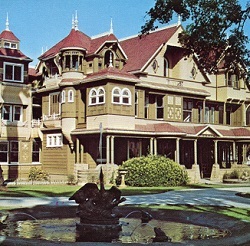 The Winchester Mystery House® is a California State Historical Landmark (#868) and was designed and built by Winchester rifle heiress, Sarah Winchester. Wander through 110 of the 160 rooms of this Victorian mansion, designed and built by the Winchester Rifle heiress. Tour the estate daily. 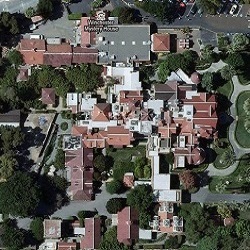 Winchester Mystery House™ is an extravagant maze of Victorian craftsmanship – marvelous, baffling, and eerily eccentric, to say the least. Tour guides must warn people not to stray from the group or they could be lost for hours! Countless questions come to mind as you wander through the mansion – such as, what was Mrs. Winchester thinking when she had a staircase built that descends seven steps and then rises eleven? Some of the architectural oddities may have practical explanations. For example, the Switchback Staircase, which has seven flights with forty four steps, rises only about nine feet, since each step is just two inches high. Mrs. Winchester’s arthritis was quite severe in her later years, and the stairway may have been designed to accommodate her disability. The miles of twisting hallways are made even more intriguing by secret passageways in the walls. Mrs. Winchester traveled through her house in a roundabout fashion, supposedly to confuse any mischievous ghosts that might be following her.